Over a period of two years, a simple four-letter word has splintered our political system into a plethora of warring camps and even threatens to shut down the federal government not once but possibly twice. Walls, both physical and figurative, are part of everyday life and, when erected properly, can be used by businesses to protect themselves from unwelcome competition or disruption. But if walls like the ones listed below are not dealt with properly, management’s ability to lead an organization can be impacted, putting a company’s very existence at risk. 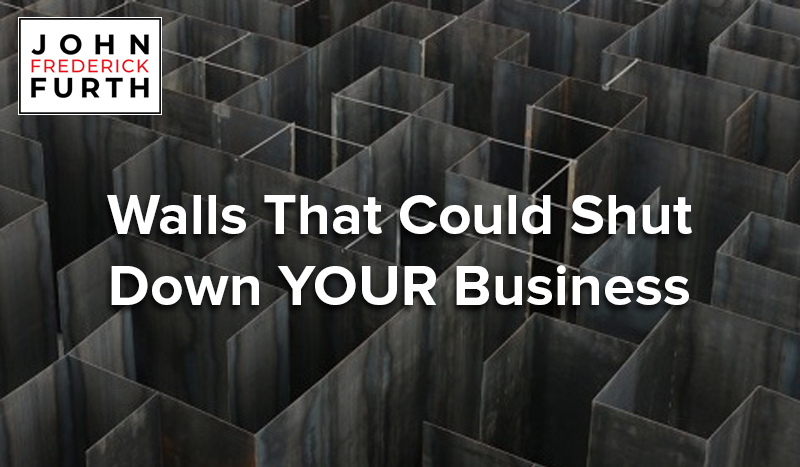 Walls that hinder communication and good decision-making. The most dangerous walls separate a company’s functions and business units into fiefdoms, damage cooperation between business owners and their investors and unravel relationships between senior executives and their staff. Like deadly diseases that go undetected for years, these walls silently insinuate themselves into an organization and often explode at the most inopportune times. Business leaders need to create and constantly reinforce cultures of listening and openness to keep them from forming. Walls that separates perception from reality. Story-telling may be a great way to communicate to a large organization dispersed around the world. But when leadership has lost its understanding of the marketplace and the all-important consumer of its products or services, a company – large or small – makes itself vulnerable to being disrupted. Don’t be the CEO who is the last to know. Walls meant to “define” a company. In the heady years of the 80’s and early 90’s, strategy consultants insisted that their clients stick to their core capabilities and assets and erect barriers to entry to their marketplace. While ideas and innovation are the life-blood of any business, make sure they don’t result in walls that lock your organization into a fixed way of being. They may hinder your company’s agility and prove too difficult to tear down before it’s too late. Constantly shifting walls of overzealous regulators. I’ve met too many small business owners who have been blind-sided by regulators who suddenly change the rules. As a business leader, you need to spend time attending meetings of your industry’s trade association, talk to your representatives on a state and federal level and anticipate disruptive changes before they occur.